On the begin i must say "thank you nevcairiel for your excelent work on LAVF!" So what is new in SAF6? SAF6 can be download here cca 13MB (changelog). SAF come with two version - locked (default) and unlocked. To unlock SAF, send me an PM. What the hell is SAF??? SAF is a solution. SAF will install and configure all needed decoders/splitter, configure them and make all working just out of the box. You can install them manually and spend weeks (if ever) make all working, or you can install SAF and do the same work in few seconds. 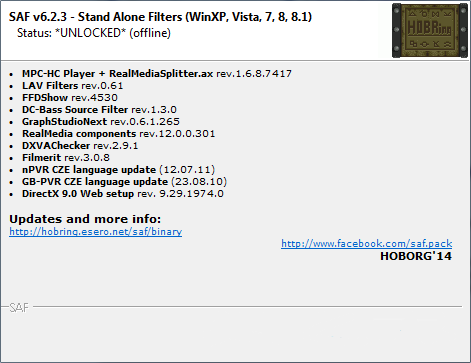 SAF was/is developed by HTPC user. Main goal is to install/touch the OS as less as possible but make as much as possible working. SAF will work on WinXP SP3 or newer. Using Win7 is recommended. What audio/video formats are supported by SAF? Well, nearly all. If you have any video that SAF6 won't play, send me small sample. Does SAF support DXVA + subtitles? Does SAF support DVD playback? Does SAF support BluRay playback? Yes, but remember you need to have any "on the fly" BluRay decrypter to play them and it will only play without menus. Does SAF support PGS subtitles? I only want to display forced subs! Does SAF support it? I have reciever. Does the SAF support audio passthrough? Is there anything else i need to install? No. Just install NPVR/GB-PVR and *unlocked* SAF. SAF should set all automatically. Does SAF support Interlced VC-1 playback? How can i see if DXVA is in use with PDVD12 decoder? If there is NV12 or DXVA, DXVA is in use, if there is YUY2 (like on picture) DXVA of not in use. SAF can do so much? How many it costs? SAF was, is and will be free. But if you think SAF helped you, you can support this project by small donation. SAF doesn't support my language, can i translate it? Last edited by hoborg; 2014-01-27 at 10:31 AM. On another matter, I've found a couple of months ago, that for some anime fansub releases it's better to have the Compatibility Mode (DXVA Video Config -> Hardware Acceleration) in Normal mode (perform all checks). I encounter a few releases, where LAV Splitter "calls" ffdshow's DXVA video codec and the video stream freezes after some frames, although the audio continues as normal. If I change the default "skip key frame check" to "Normal". LAV no longer calls the DXVA codec for those files, and uses the "regular" video decoder instead solving the video freezing. My question being: is there a performance gain by skipping the ref frame check? SAF setup prefered subtitles language acording language you select durning SAF setup. If LAVF didnt found your language stream, it will fall back to ENG. But that doesnot mean you will loose subtitles, you just can switch to next audio track. I didnt see a problem in this. About FFdshow's DXVA decoder - LAVF splitter wont call anything. FFDshow DXVA decoder is alwyas added to graph by default if you want to play for example DXVA compatible MKV file, but if FFDshow DXVA decoder found you OS/GPU is not capable to play it correctly, FFDShow DXVA decoder refuse connection and graph build process fall back to next video decoder - FFDshow video decoder. That is what "skip key frame check" controls. hoborg, ur latest release works a lot better then the previous, thanks. Now small q: what's the difference between forced subs and not ? How can I make subtitles work with blueray ? Forced subtitles are like you have movie in english, and there are some german dialog. The forced subtitles apear only on this german dialog. And yes, BluRay subtitles are supported. I have just installed SAF6 on my machine (Radeon HD 5570, Win 7) and as far as I can tell everything works ok. Thanks. 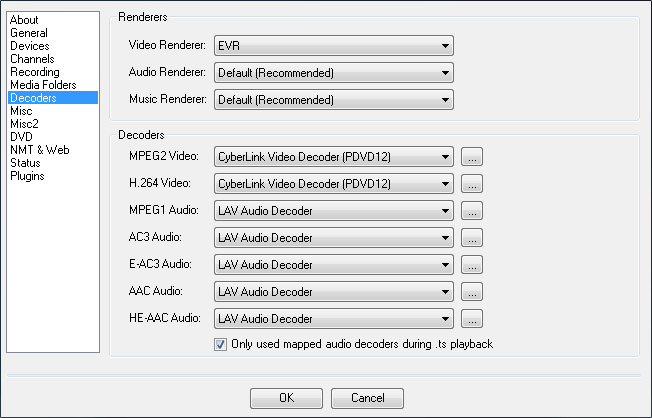 I have PDVD11 and EVR selected in npvr decoder settings for H.264 content. Judging by cpu usage and based on information from graph studio (EVR input pin) DXVA is enabled. But for some reason every time I go to the PDVD11 properties page (from nPVR decoder settings), the tick box for DXVA is not selected. It allows me to set the DXVA tick box, but the next time I open it, it has reverted to "SW". Any ideas why is this? How you access PDVD11 settings? It is not possible to do it if you connect to remote graph i think. By dafault SAF installation, DXVA is ON. Yes I too think DXVA is actually on, but PDVD11 properties window says it isn't. Every thing closed (including graph studio). Start nPVR application and enter nPVR settings. Under decoder settings click on the ... button next to H.264 decoder (selected as PDVD11). the PDVD properties dialogue opens, which has a DXVA combo box. The selection is always set "SW" and not "DXVA".